Radar leveling, reagent-free liquid analysis, ultrasonic control, wireless measurement devices, advanced predictive diagnostics, SCADA control systems—why are technologies like these mentioned in the same breath as the cost-sensitive municipal water treatment plant? The answer: savings. Case histories are showing the cost savings water treatment plants can garner from investing in emerging advanced analytical, diagnostics and measurement technologies, as well as the control systems that manage those technologies. Take, for example, this case history that represents many water plants around the country. Taylorsville-Bennion Improvement District serves 70,000 people in approximately 14 sq miles in the center of the Salt Lake Valley, Utah. The district has approximately 16,700 connections and 229 miles of water lines. For many years, it tried to keep its old chlorine and fluoride sensors and analyzers running by constantly rebuilding, recalibrating and replacing parts. While this seemed like the cost-effective thing to do, it was proving too much for the district’s small staff—a situation familiar to many managers. The units were laborious to rebuild and required replacement of two to three probes per year; plus, they used expensive membranes that were difficult to replace and often broke during installation. The district estimates that the cost to operate the old sensors and analyzers was approximately $9,000 per year at its three locations. The units required daily attention and annual rebuilds, adding labor costs to the equation. When the district decided to replace the old sensors and analyzers with the latest technology, its situation changed drastically. The new systems were built to last three years, versus one year, and were known to be effective as long as 15 years. The new technologies were reagent-free, reducing costs and maintenance, and needed far less frequent calibration. Bottom line: The district now has to replace the membranes and electrolyte of the chlorine systems for $150 per year, compared to more than $6,000 in maintenance costs for the old systems. While the new equipment was costlier to purchase, the dramatically lower cost of ownership is rapidly offsetting that differential—a situation that can apply to many technologies. There was a time when suggesting replacement of standard pressure transducers with non-contacting radar in a water plant might have produced laughter. Not today. The city of Kingsport, Tenn., has a raw sewage pumping station that was built in 1957. All of the city’s sewage and storm water is collected in this station prior to distribution. Frequently, when normal rain occurs, the original parshall flume built to handle overflow will overfill. This excess storm water and sewage travels into an area that is 18 by 50 by 27 ft. From this area, there are six vertical turbine pumps that activate based on level readings to keep the entire intake station from flooding. They pump up to 25 mgd to the nearby treatment facility. loop-powered, non-contacting radar, the radar was able to easily detect the smaller surface area when the level was low, while ignoring false disturbances in its beam path. The radar readings operate during the turbulent storm water runoff as well as when low intake levels are reached when there is a lot of raw sewage and debris. Previously, the pressure sensors were failing around every six months. Because of the harsh environment, the replacement of the sensors was not a work order that any maintenance person wanted. No more maintenance work orders are needed for the level measurement and the reliability of the station has significantly improved. The Lower Berkeley County Wastewater Treatment facility in Goose Creek, S.C., also has demonstrated foresight when it comes to technology. The facility had problems with primary sludge coating the electrodes in the flow tube, causing the meter to fail. The process had to be shut down and the tube removed, cleaned, and placed back in-line, causing significant downtime and increasing maintenance costs. Maintenance personnel had to be reactive in their response to the loss of signal from the device because they never knew when the unit would fail. They solved the problem by utilizing advanced predictive diagnostics that signaled a coated electrode on the flowmeter prior to the loss of signal from the meter. Because the diagnostics provided two levels of alert, warning of coating and imminent loss of signal, maintenance could be scheduled to optimize process uptime. These kinds of upgrades to technology apply in many other cases. For instance, pressure transmitters are a staple of every type of water treatment facility. A transmitter with longer-term stability means less-frequent calibrations are required. A typical pressure transmitter needs to be calibrated once every two years. Each time a calibration is needed, a transmitter has to be taken off-line and expensive calibration equipment is required to get the job done. With newer technology and a more stable transmitter, calibrations can be reduced to once every 10 years. Pressure calibration typically requires two person hours per device, which means a $150 to $200 expenditure. In a plant with many pressure devices, reduction in the frequency of calibrations can save $500 per transmitter over 10 years, adding up to many tens of thousands of dollars per plant. One example of calibration’s importance is the Fountain Sanitation District in Fountain, Colo. The district needed to maintain the viability of the biologically active materials in its sludge, but used a flowmeter that had to be removed from the process and calibrated on an annual basis—a maintenance activity that exposed the workers to hazardous materials and required an additional spare flowmeter. As a result, the required calibrations affected operations costs, and throughput was at risk due to decreased biological activity. By switching to a newer magmeter system that does not require removal from the process for calibration, the negative operational impacts were virtually eliminated. Additionally, the new system, with integral meter health diagnostics, provided continuous data on the accuracy of the system and the ability to report the health of the meter in real time. Water plant managers now are aware of the feasibility of reliable wireless systems for their applications, and many analytical instruments will now operate wirelessly through highly reliable mesh networks. Since wireless makes the integration of plant operations possible without costly trench digging and wires, virtually every water facility in America is in some stage of wireless consideration. As water treatment plants have evolved to implement a variety of advanced networks, systems and instrumentation, they also have shifted to more sophisticated control and SCADA systems. It was not that long ago that many municipalities controlled their operations manually. While that was sufficient at the time, today the data and regulatory requirements are much more complex. An integrated control and SCADA system helps plants collect and store information from across the whole water distribution network and quickly produce automated reports to meet regulatory demands, as well as improve plant operations. Another major concern for municipalities is cybersecurity. Cybersecurity threats are critical and increasing, and not only is the plant itself vulnerable to attack, but also the entire water distribution and wastewater collection infrastructure could be targeted, posing a significant danger to the public. While there are not yet security regulations in place for water plants, many are beginning to deploy new cybersecurity measures within their control and SCADA systems to better safeguard communities. One common mistake plants should avoid in their automation strategies is a piecemeal approach, in which standalone subsystems and programmable logic controllers (PLCs) are installed to control different plant applications on an as-needed basis. The primary pitfall occurs when they discover that these systems cannot adequately integrate or communicate with each other, leading to disparate islands of automation throughout the plant. 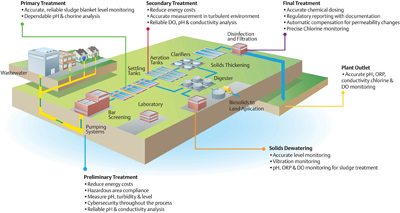 To address this, some water treatment facilities are implementing integrated, enterprise-wide automation systems that can connect all plant areas and applications to optimize operations. Integrated systems provide extensive data that can be used to help municipalities make informed decisions for improving plant processes and productivity. These solutions also can be scalable, providing a path for future expansions and upgrades. These are just a few examples of where new measurement and control technologies can be utilized to reduce the overall cost of operating a water treatment plant. While cost-conscious municipalities need to evaluate these new technologies carefully for their potential reduction in maintenance costs, improvement in reliability and accuracy, increased ease of use, enhanced security, and more, the bottom line will frequently demonstrate that an investment in new technology today will represent long-term cost savings and improvement in operations. Tom Johnson is Rosemount water industry business development manager for North America for Emerson. Johnson can be reached at [email protected].